Discover how this deceptively simple tool can provide tonnes of useful information. The purpose of a dive bezel is to track elapsed time underwater. 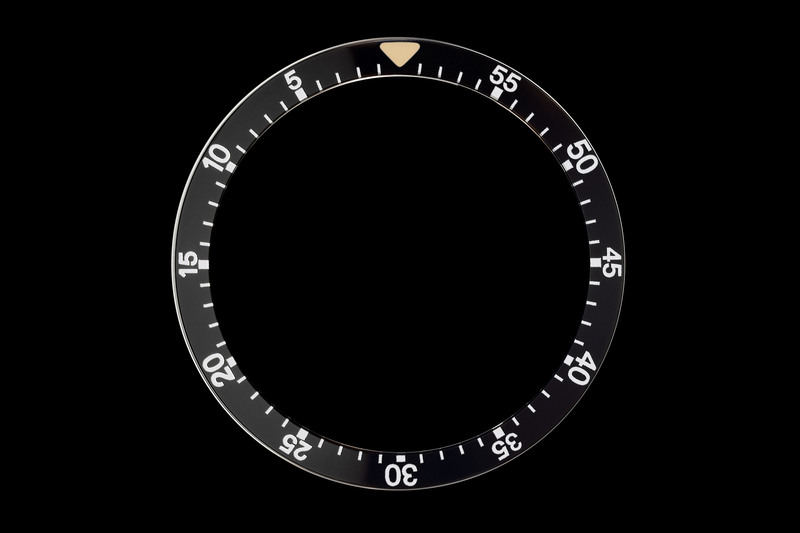 One of the ISO 6425 standards for a divers’ watch is that it must be fitted with a unidirectional bezel with a scale showing 60 minutes and markings at least every 5 minutes, well as a pre-select marker (usually in the form of a luminous triangle or diamond) to mark a specific minute reading. Since chronograph pushers jeopardise water-resistance, some of the first modern underwater watches, coinciding with the advent of the scuba, settled on a much simpler solution to time immersions with the incorporation of a rotating bezel. 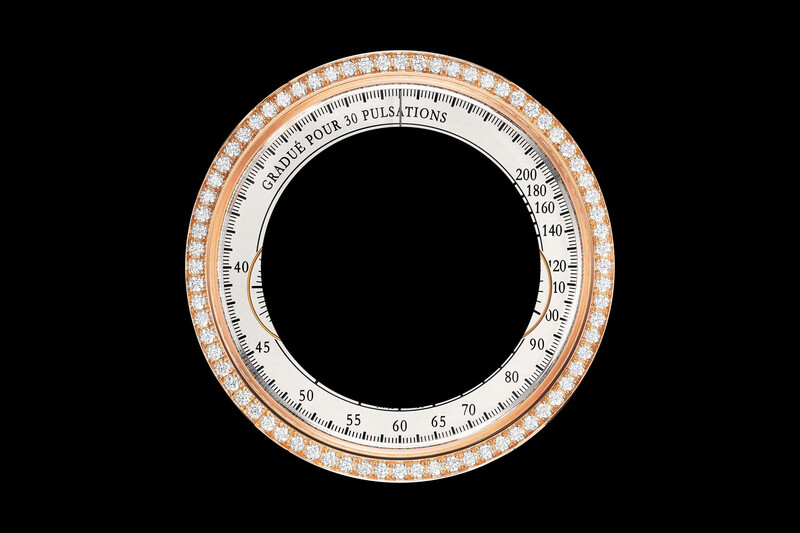 A classical example of a diving bezel, or count-up scale. 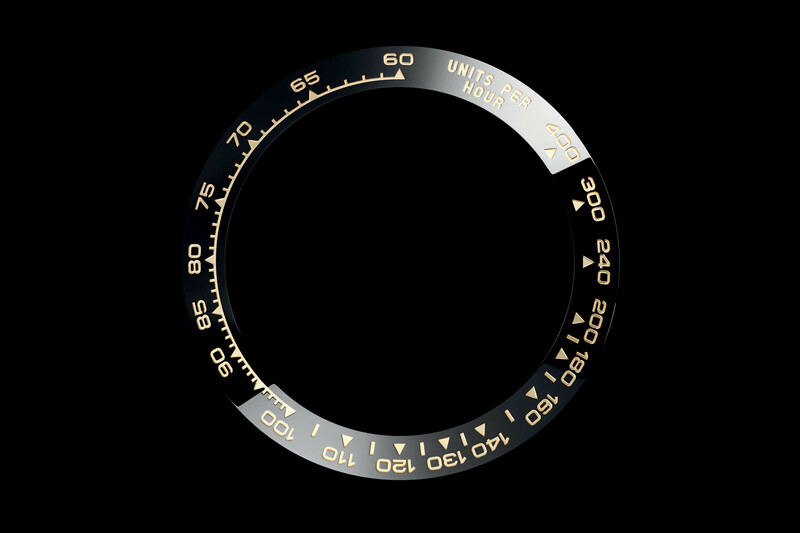 Most dive bezels go beyond the ISO 6425 requirement of 5-minute interval markings and feature 1-minute markings from 0 to 15 (sometimes up to 20 minutes and picked out in colour), with the rest of the 60-minute bezel marked with 5-minute increments. This is the standard layout and became the popular look of dive watches thanks to pioneers like Blancpain’s Fifty Fathoms of the early 1950s and the Rolex Submariner. The idea that a bezel is still used to time how much air is left in a diving tank is slightly obsolete today; for this, there are pressure gauges and dive computers, but it is always a good idea take an extra backup companion like a mechanical watch. For an in-depth look at dive watches, don’t miss Xavier’s article. 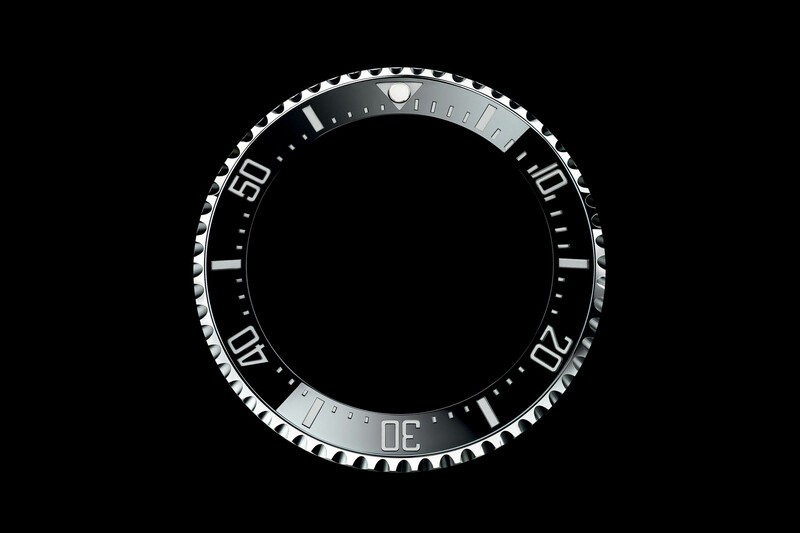 A diving bezel, as found on a Sea-Dweller – probably one of the most iconic bezels ever created. 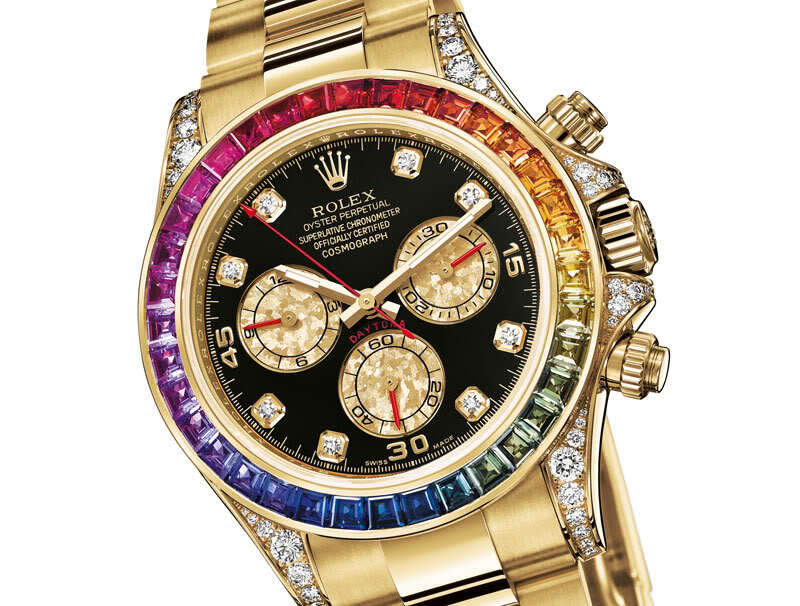 The two key players to time immersions are the minute hand (often picked out in bright colours) and the bezel. To operate, simply twist the bezel so that the zero marker (triangle) aligns with the minute hand pointing to the current time. As the minute hand advances, it will also indicate elapsed time on the bezel in a simpler and more visually graphic manner. 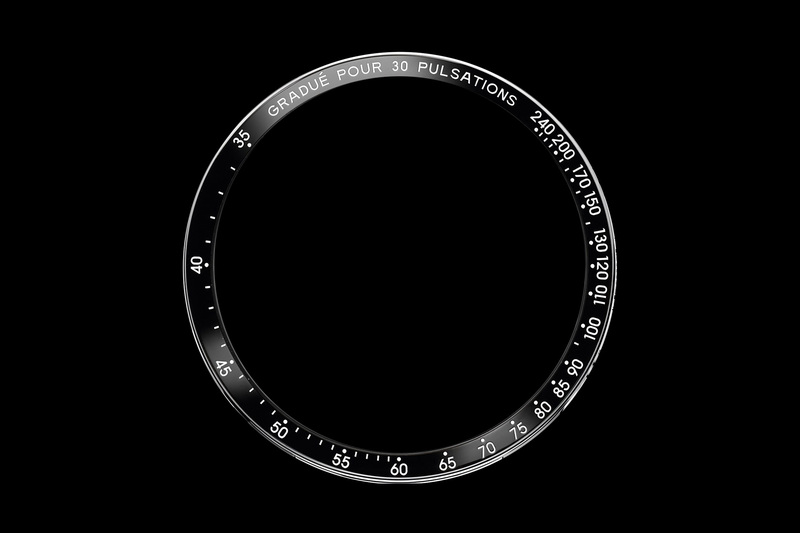 Most rotating bezels are unidirectional, capable of being manipulated in one direction only. In the case of dive watches, this direction is anticlockwise to avoid accidental blows that might dislodge the bezel and lead the diver to believe he/she has more time than originally programmed. The type of diving scale found on a “compressor” watch – it is located around the dial, under the crystal and actuated by a second crown. However, it is bidirectional, and thus doesn’t meet with the ISO 6425 standards. Another variation on the theme to time immersions is an internal rotating bezel, usually set with an additional crown at 4 o’clock – on so-called compressor watches, such as the Longines Legend Diver. For hyper-security and to avoid any unpleasant surprises, Omega’s monster of the abyss – Ploprof – has a locking device on its bezel that needs to be disengaged before it can be manipulated. The downside is that in real life conditions, a scuba diver will set the bezel on his wrist just before plunging into the water with one hand. A watch like the Ploprof might be the epitome of safety, but it does require two hands to set. 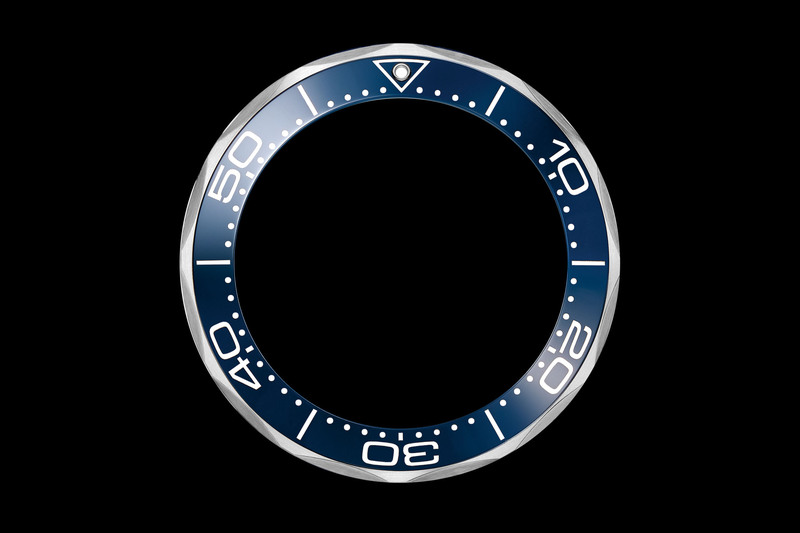 A variant of the dive bezel, which is, in fact, just a count-up scale graduated on 60-minutes, is the countdown bezel. 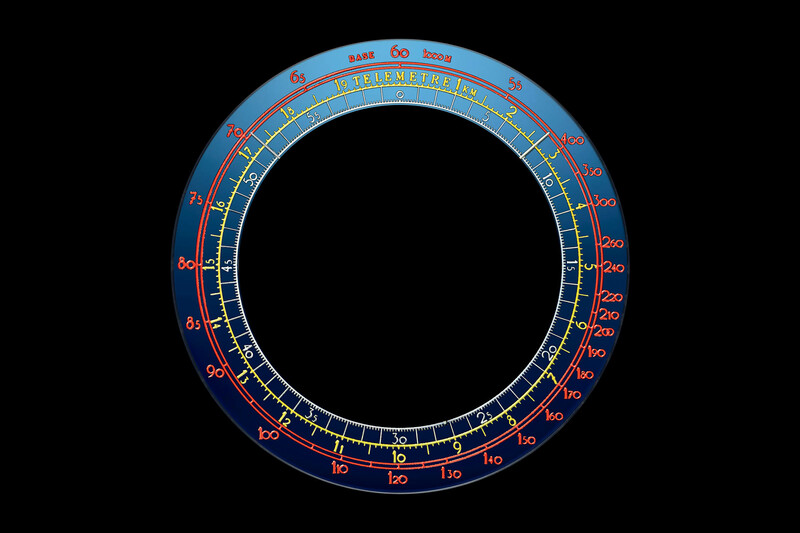 On such bezels, the scale (which can be 60 minutes or 12 hours) is printed counter-clockwise and allows you to measure the time remaining in an event, either before the event begins or after it has started. 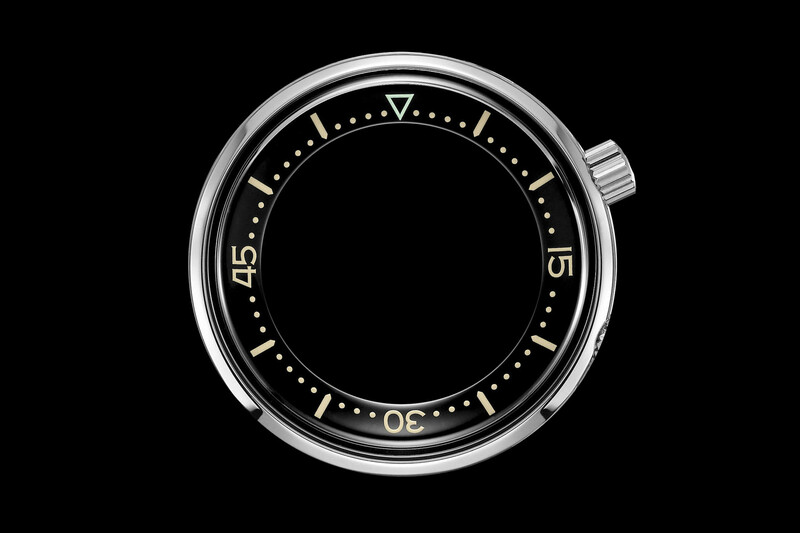 Countdown bezels are typically bidirectional, which makes them inadequate for diving. A countdown bezel is basically a reversed diving scale – numerals are positioned counter-clockwise but the working principle is the same. These bezels are often found on pilot or military watches, and they were used to conduct military strikes – countdown after launching a bomb, for instance. 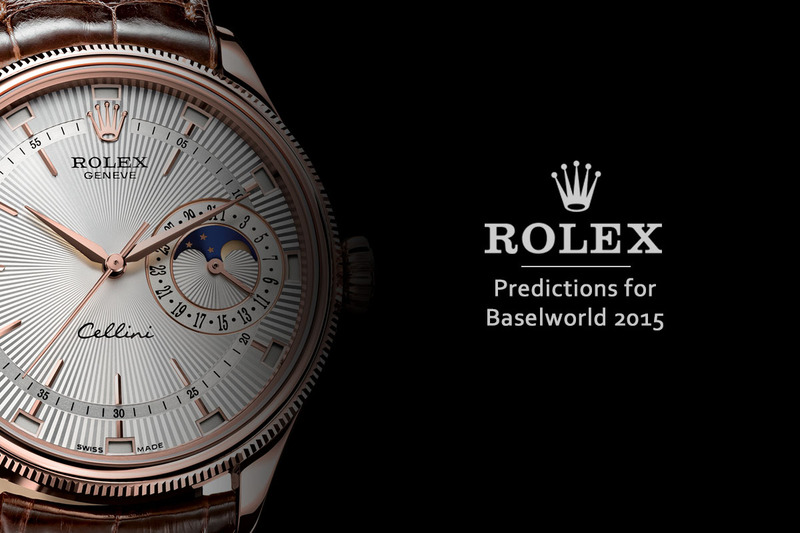 Also, such countdown bezels are useful for regatta races. To use them, the principle is the same as with a dive bezel. The minute or the hour hand is used as a reference: rotate the bezel so that the time remaining is set to the dedicated hand. When the hand reaches zero on the scale, the event should occur. One of the brands using countdown bezels is Sinn, a military/field watch specialist. The 103 and 104 models can be fitted with such scales. Next up is the tachymetre, another very useful function that can be seen inscribed on the bezel or dial of many chronograph watches. The main use of a tachymetre is to measure the speed of an object travelling at a fixed distance, but it can also be used to measure distance and calculate anything that might take you less than a minute to accomplish – tie a bow tie? 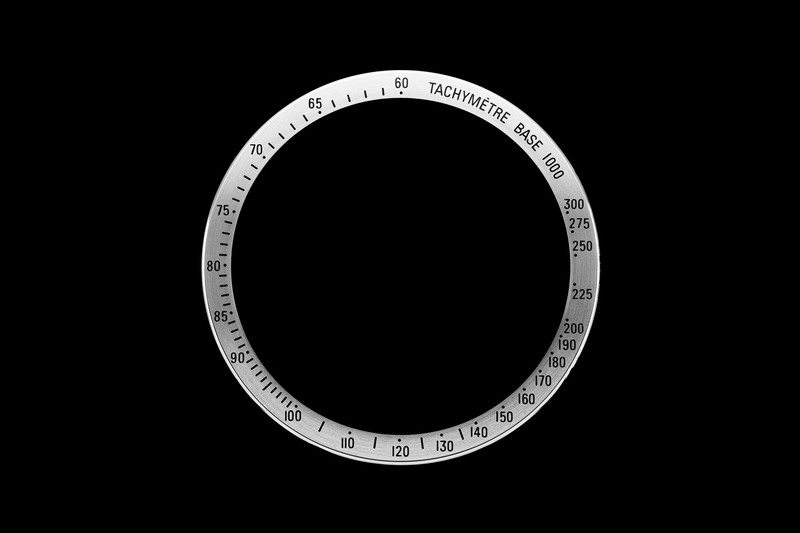 Unlike a dive bezel, a tachymeter (US), tachymetre (UK) or tachymètre (FR) scale is fixed and has nothing to do with a tachometer scale on a car that measures RPM. Omega’s Speedmaster is a great example of a chronograph with tachymetre functions and features a scale running from 500 to 60. 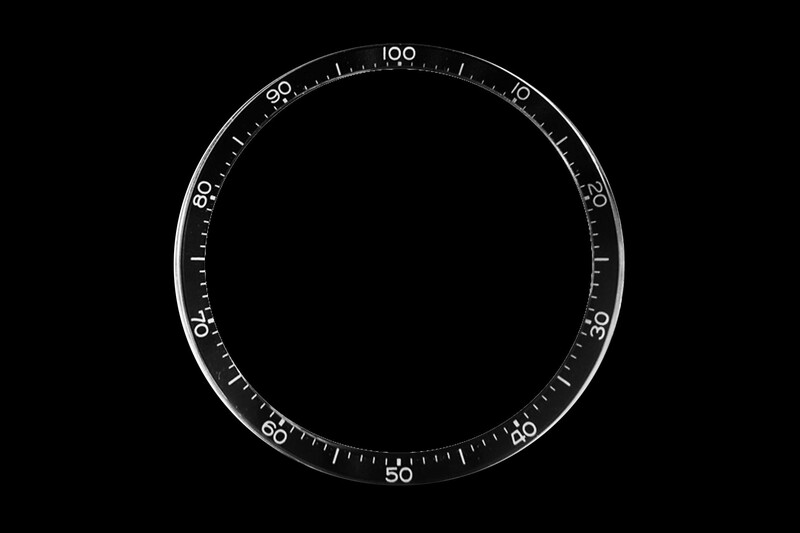 The tachymeter bezel of a Speedmaster. Omega was the first, back in 1957, to put the scale outside the watch – tachymeter or other scales on chronographs were previously printed on the dial. A tachymetre is, in essence, a conversion tool used in conjunction with the chronograph allowing you to convert elapsed time in seconds to speed (in units per hour) for events lasting up to one minute. (For those of you with a mathematical bent, a tachymetre = 3600 divided by elapsed time in seconds.) The beauty of a tachymetre is its neutrality (hence the word UNITS engraved on some bezels, like the Rolex Daytona) and almost any unit of measurement can be employed – kilometres/miles/metres/knots and even cans of tomatoes travelling on a conveyor belt. The bezel of a Rolex Daytona – as you can see, it is neutral (units per hour), meaning that it can measure speeds in knots, kph or mph. It all depends on the distance you decide to set as a base. Supposing you know that the distance a car will be covering between A and B is 1 km. To gauge the average speed of the car, hit the chronograph when the car reaches A, and stop it again when it reaches B. The corresponding reading of the seconds hand against the tachymetre scale will give you the speed. However, if you are determining the speed of an athlete running a 200-metre race, which she completes it in 28 seconds, the tachymetre reading of 130 km/h will need to be divided by five (1/5th of a kilometre) to give you the average speed of 26km/h. You can also use a tachymetre to measure anything that takes under a minute to accomplish. You’ve always wanted to know how many bow ties you could tie in an hour. By using your chronograph, you discover that it takes you 45 seconds to tie one bow tie, which corresponds to roughly 80 on the tachymetre scale meaning you can tie just over 80 bow ties in an hour (or you can do the math and divide 3,600 by 46 = 78,260). 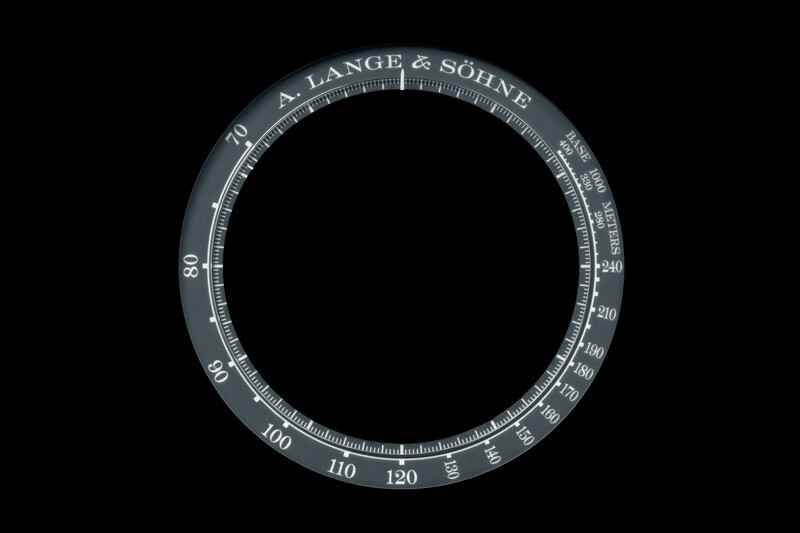 The bezel of the A. Lange & Söhne Datograph Lumen – the principle is the same but the scale is located on the periphery of the dial. A tachymetre can also be used to measure distance travelled, if you know the speed and the speed remains constant. Imagine you are driving down the motorway on cruise control at 120 km. Start the chronograph seconds hand and when it reaches 120 on the tachymetre scale, you will have covered 1 km. This is an obvious example but can be extrapolated for more complex calculations. An invaluable travel companion that is easy-to-use and gives you the time in two (sometimes even three) different time zones simultaneously is a GMT scale on the bezel. 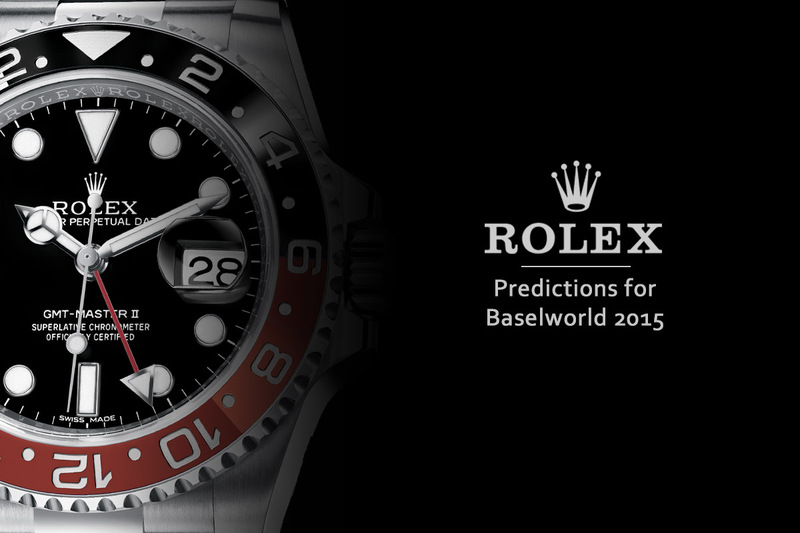 The most famous GMT model is the pioneering 1954 Rolex GMT-Master. Designed in cooperation with Pan Am for its crew on long-haul flights, the GMT-Master and its two-tone red and blue (Pepsi) bezel shot up to iconic status. Equipped with a fourth hand and a 24-hour track on the bezel, the GMT Master paved the way and established the look of many future GMT watches. The “Pepsi” colourway of the Rolex GMT Master II is used to differentiate daytime hours from night-time hours. The main 12-hour dial of the watch is normally used to indicate local time while home time is set on the 24-hour bezel and read off by an additional hour hand or pointer. Usually, the GMT hand has a different shape or colour to distinguish it from the hour, minute and seconds hands. To use the GMT function, simply twist the bezel into the neutral position by aligning the triangle with the 12 o’clock marker on the dial. Set the GMT hand via the crown to the time zone of your choice (usually home time) by aligning the hand with the time on the bezel. Then set local time with the main hand. You can also use the rotating bezel to set a third-time zone, but you would lose the 24-hour function and might get confused about whether it is X pm or X am back home. 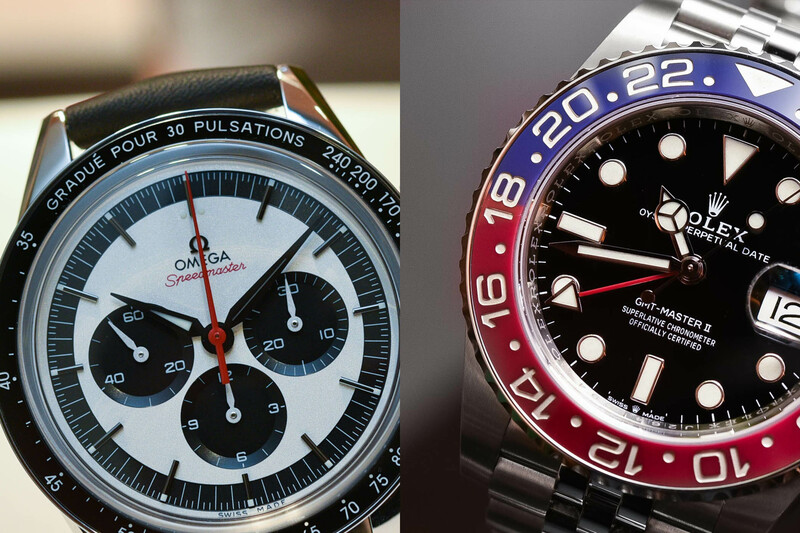 The “Pepsi” colourway is now also used by Tudor, the sister brand of Rolex. 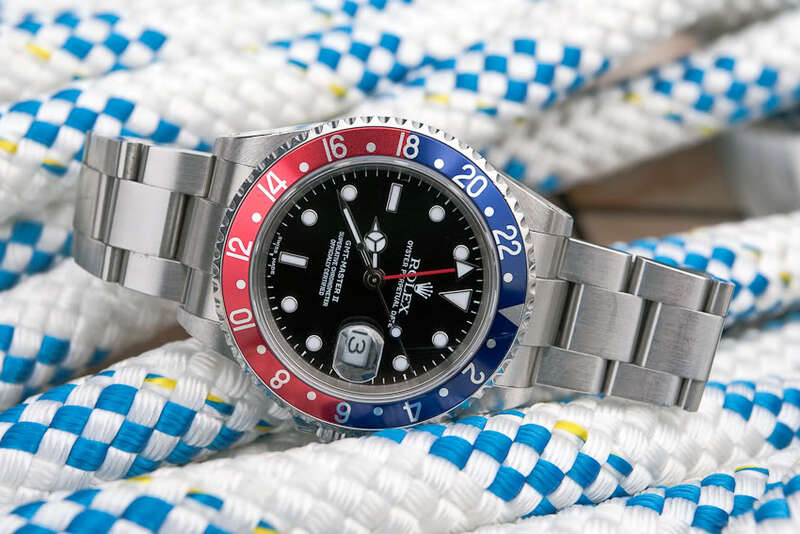 A bumper crop year for lovers of the Rolex GMT-Master II, the giant Swiss brand presented its icon in a steel version and Tudor jumped on the bandwagon with its Black Bay GMT with a Pepsi bezel. Intimidating to the uninitiated, a slide rule bezel is a complex but powerful calculating tool. When it comes to slide rule bezels, Breitling rules the roost with its 1952 Navitimer, an adaptation of the famous Chronomat designed specifically to aid airborne navigation. A complex on-the-wrist flight computer equipped with two logarithmic scales, anybody with a mathematical mind can execute an infinite number of complex calculations. The sliding rule of a Breitling Navitimer – certainly the most emblematic watch to use such complex scales (and also one of the few). 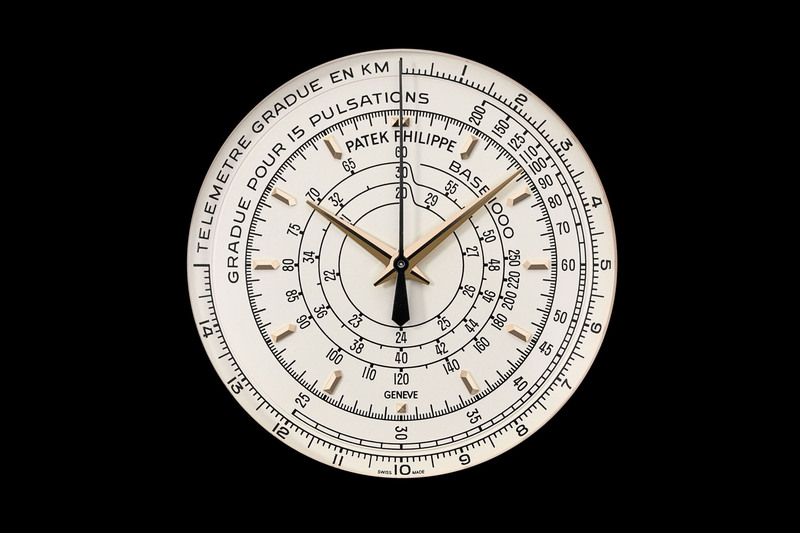 The original slide rule bezel featured the three most important units for pilots: STAT for standard mileage, KM for kilometres and NAUT for nautical miles allowing pilots to calculate fuel consumption, airspeed, time, distance, convert miles to kilometres and perform a host of other useful functions. 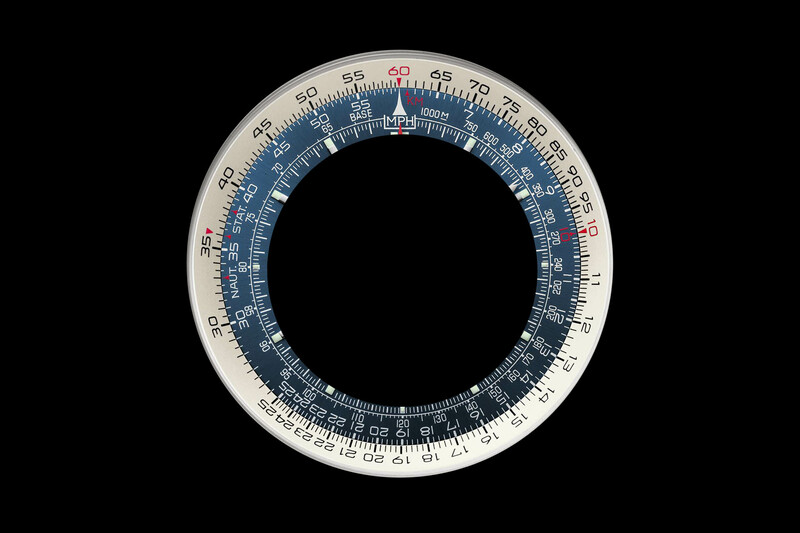 Slide rules are, for the most part, extinct objects in our lives today so coming to terms with how to use one will require patience and a willingness to learn. However, simpler tasks like multiplications and divisions can be performed and it might be a good party trick to learn before strapping on one of these powerful analogue calculators. The external bezel found on a vintage Heuer Calculator. Let’s say you want to multiply 16 x 8. Turn the outer rotating bezel scale to line up number 16 with the number 10 on the next bezel (picked out in red on the Navitimer and used as the unit index or reference point in the alignment of the rule). 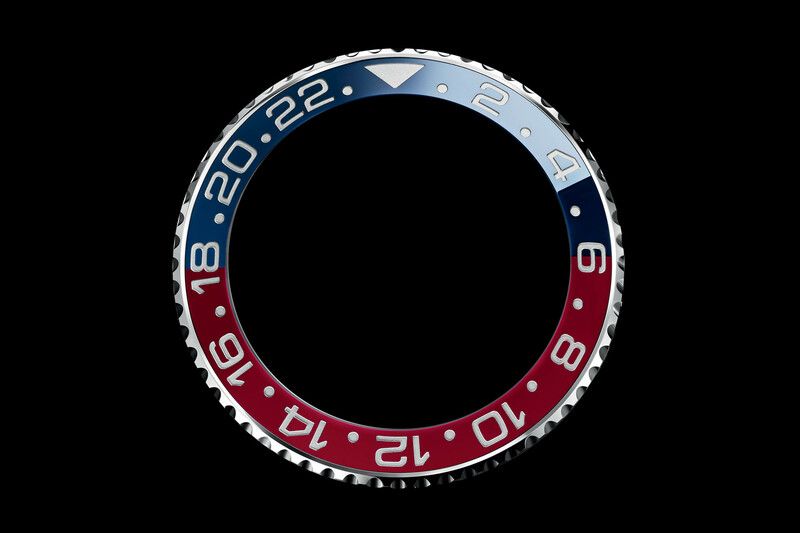 Then find the 8-marker on the inner bezel and consult the number on the outer bezel which should be 128. Dividing works in reverse. For more complex operations, arm yourself with patience and devour the thick manuals that accompany these models. If you are in the market for vintage editions, do take a look at the Sinn Ref. 903 Chronograph, a classic aviator watch bristling with information. Designed for anybody who wants to determine their heart rate and very popular with doctors in the pre-digital age, pulsometer scales can be placed along the circumference of the main dial or even etched onto the bezel. Relying on a central chronograph seconds hand, the pulsometer will measure the heart rate over a base of 15 or 30 pulsations. An example of a Pulsometer scale – here, the Speedmaster CK2998, with a scale based on 30 pulsations (not the most usual). All you have to do is start the chronograph, count the beats corresponding to the calibrated pulsations and consult the position of the seconds hand on the outer scale to determine the heart rate (pulse rate) in beats per minute. Even ladies’ chronographs can be fitted with functional scales – at least, Patek thinks so. Pulsometers can turn up in all sorts of places, from the sporty dial of the Omega Speedmaster CK2998 to the refined habitat of A. Lange & Söhne’s Chronograph and Patek Philippe’s delightful ladies’ Chronograph Ref. 7150. Longines adds a second “doctor’s” scale to some of its watches: the Asthmometer (here in blue). The principle is the same but it measures breaths instead of pulsations. 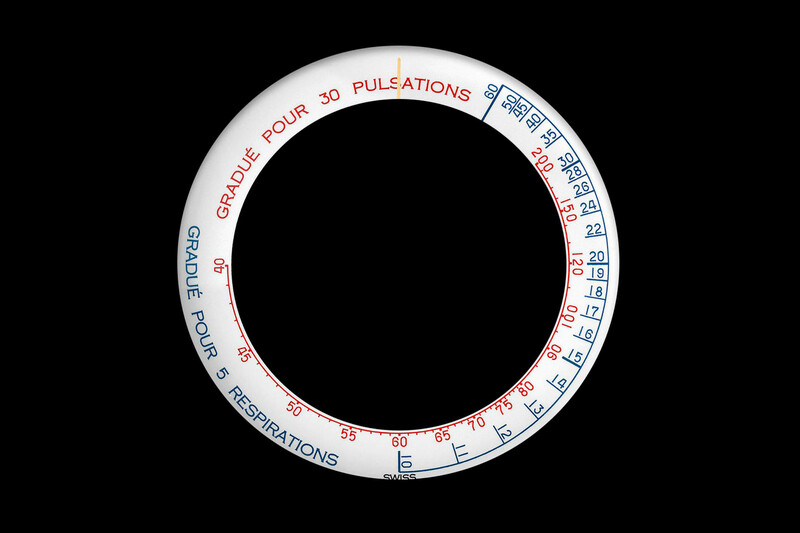 A different version of the pulsometer bezel is the Asthmometer. This type of scale also refers to doctor’s watches, but instead of measuring heart rates, it measures breathing – by indicating the number of breaths per minute. This type of scale was also useful for athletes to measure their breathing before and after an intense effort. The telemeter scale, designed to measure distances to remote objects, became a vital tool to calculate fire range in battle and, like the tachymetre and pulsometer, operates in tandem with a chronograph. Since light travels faster than sound, the idea was that as soon as a soldier spotted a flare of light on the horizon, he could activate the chronograph and then stop it when the cannon exploded – if he was lucky. The unique F.P. Journe for Only Watch 2017, with 3 different scales on its dial, including a telemeter (in yellow). Today the only real function of a telemeter is to calculate the distance of a storm based on the elapsed time between lightning and thunder. Not as prevalent as tachymetres, telemeters have appeared on the TAG Heuer Calibre 18, more recently on the Kickstarter-funded William L. Automatic Chronograph and on F.P.Journe’s jazzy Chronographe Monopoussoir Rattrapante auctioned at Only Watch 2017. Far less common than the tachymetre, the decimal bezel divides the minute into 100 parts allowing for the decimal conversion of time. Used primarily for industrial and scientific timing operations – to make calculations of time or cost prices – the decimal bezel is used in conjunction with the chronograph allowing you to measure and translate time into decimal values in a controlled environment. The classic example provided by Omega in its vintage Speedmaster manual describes a calculation to estimate the time taken to cut a screw. By starting the central seconds hand of the chronograph when the production-line worker picked up the screw and stopping it when he picked up the second screw, the overseer could come up with a decimal reading making life simpler when having to make longer calculations. The decimal bezel on a vintage Speedmaster – back in the 1960s, the Speedmaster was available with a tachymetre insert as standard, but telemeter, pulsometer and decimal bezels were possible as an option. TAG Heuer (Ref. 2447D) and Omega produced several models with decimal scales in the 1960s and the Speedmaster could be customised with one of four bezels: a tachymetre, a pulsometer, a telemeter and a decimal scale. Very informative, but the Ploprof bezel is 100% operational with one hand. If the watch is on the left wrist, as most people do, you simply use your middle finger to depress the locking button, and use your index and thumb to rotate the bezel as you would with a normal rotating bezel. Very cool. Thank you, Rebecca.